Here’s a neat image of The Modern Marketer from Salesforce. Click on the image or here to go to the source. What are the hard and soft skills that make up a modern marketer? Ryan cited some research from Forrester (B2B CMOs Must Evolve or Move On) that supports the notion that the skills to be a successful marketer today are different from those needed in the past. For instance, when given the statement “The breadth of skills needed to succeed in marketing has increased dramatically”, 63% of the survey participants “strongly agreed”, and 33% “agreed”. So 96% believe it to be true. Furthermore, 44% of the participants “can’t find people with the right skill sets” to fulfill those marketing roles. I’ve gotta say, that’s consistent with my own direct experience (long searches to find the right person) and with what I hear from colleagues and recruiters in the region. 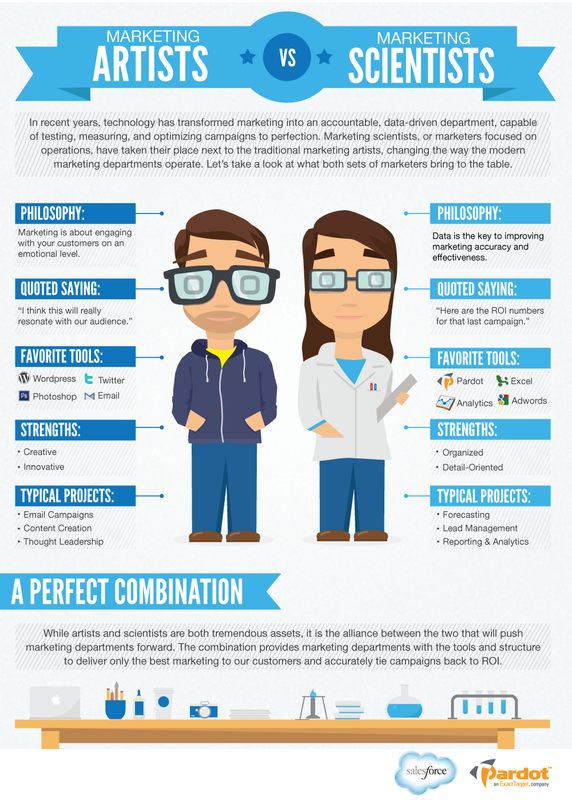 So what’s actually in the modern marketer’s broad skillset? I agree with all of those and, while it’s perhaps controversial, I couldn’t agree more with that last point. My experience is that people either are instinctive marketers, or they aren’t, and no amount of experience or coaching will suddenly switch on that instinct. It sounds harsh, and perhaps it is, but I’m calling it like I see it. Now, to balance that statement slightly, I’ve also come across some fine instinctive marketers who don’t think of themselves as marketers at all. Sometimes they equate “marketing” with “advertising”, and on that basis they conclude that they’re not marketers. And sometimes they’re so natural at the soft skills (e.g., good listeners, empathetic, clear communicators, etc.) of marketing that they don’t realize (a) that they possess those skills, and (b) how rare those skills really are. Whatever the reason, I’ve had the pleasure of working with some great marketers who just happened to be in other roles. Personally, I’ve always been more involved on the messaging and content creation side of things, and only fairly recently have I gained increasing exposure to the new aspects of digital marketing like marketing automation, Adwords, SEO, and lead management. In fact, I’m consciously increasing my exposure to the digital communications side, and I’m doing so for two reasons: 1) knowing those techniques will feed back into my content creation, so I can make that content even more compelling; and 2) if I’m ever to succeed as a CMO or a CMTO, then I’ll need to know digital marketing inside-out. Even if I’m not engaged directly with those activities, I’ll be overseeing those functions. Luckily, unlike intrinsic characteristics, such skills as those listed above can be learned (and I have wonderful co-workers who so far don’t mind me sticking my nose in). It’s still all too common for me to encounter people who jump straight into tactics without even considering what the big picture objectives and strategies are. Now, none of those bulleted items above might strike you as particularly surprising or special, but to be a truly elite marketer you need to possess them all. When I think of the most effective soccer teammates I’ve had or the most dangerous opponents I’ve faced, I realize that their effectiveness comes not from one singular thing that they do brilliantly or a particular skill they have, or even a few things or skills; instead, it’s that they do every single thing very well. To be an elite marketer takes the same collective packaging of many skills into something remarkable. When I think of the most effective soccer teammates I’ve had or the most dangerous opponents I’ve faced, I realize that their effectiveness comes not from one singular thing that they do brilliantly or a particular skill they have, or even a few things or skills; instead, it’s that they do every single thing very well. To be an elite marketer takes the same collective packaging of many skills into something remarkable. ‹ To Insource or Outsource Marketing?